I just wanted to drop you a line about your product because as soon as I received it I went right out to do battle with the wasps that are embedded in the high up cracks and crevices of our home and I have to tell you, I love it. It's such a simple and easy to use design and your pricing is wonderful. I will be spreading the word about this marvelous little item. We have tried many different systems over the past 15 years and I can assure you that you have the most versatile, efficient and cost-effective system for pest control professionals. Other systems are either bulky, jamming, or expensive to manufacture. When you get a chance, could you please enquire about the cost of selling us + shipping of 10 kits (i.e. Gotcha Sprayer Pro, Powder Duster, Scraper, and a European adaptor). 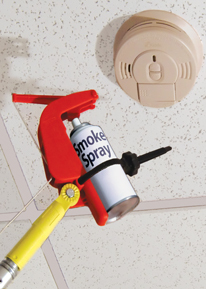 Fire Safety Professionals now there is a cost effective way to test commercial smoke detectors using the Smoke Sprayer. 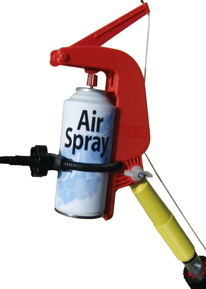 Simply secure a can of aerosol smoke detector tester to the Gotcha Sprayer, attach the Gotcha Sprayer to an extension pole, adjust to the desired angle and spray. 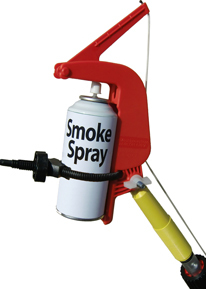 The Gotcha Sprayer works with virtually any brand of smoke spray and air spray. Smoke Spray - Any brand of smoke detector tester. Air Spray - Cleans smoke alarms and electronic equipment. Using a 24' extension pole (purchased separately) you can easily reach the smoke detectors in commercial buildings and lobbies. The Gotcha Sprayer has an adjustable angle, can attach to any extension pole with a standard American threaded tip and costs so much less than the competition. It reduces the risk of ladder injuries and is simply a better way to certify smoke detectors. The Gotcha Sprayer adaptor has been tested with most commercially available aerosol Smoke Detector Testers. The Gotcha Sprayer adaptor is most cost effective solution on the market. Can be angled to spray hard-to-reach areas. Can be attached to any standard extension pole.